For the first time since 2015 all the affordable and liveable suburbs in Sydney had negative annual median price growth, a sign of market cooling. Prior to this, affordable and liveable suburbs showcased positive growth, thus, in this report it became a task of nominating suburbs with as moderate a softening as possible. For the first time since 2016 the first and lowest price band of $0-$500,000 has opened to Sydney buyers, at 1.4% of the market. Although this is a very marginal part of the market, this marks a more affordable Sydney. Interestingly, Brisbane and Sydney have come out as the beacons of hope for those looking for affordability, with access to the less than $500K price bracket increasing. For Brisbane this increased from 10.6% in the 2nd half of 2017 to 12.4% in the 2nd half of 2018. The 2nd half of 2018 marks a momentous occasion for Sydney, as for the first time since 2016 buyers will be able to access the less than $500K market, albeit at the smallest percentage across capital cities at 1.4%. The PRDnationwide Affordable and Liveable Property Guides 2nd Half 2018 aim to identify affordable and liveable suburbs within 20km from each capital city’s CBD. Considering all methodology criteria (property trends, investment potential, affordability, project development, and liveability factors), Table 3 identifies key suburbs that property watchers should look out for. Table 3 highlights in general that Sydney has the highest entry price yet the lowest rental yield. In saying that, the Sydney house rental yield is comparable to that of Melbourne, potentially due to a softening in Sydney median house prices. This is good news for investors, given the past 24 months house rental yields in Sydney have been one of the lowest across all capital cities. 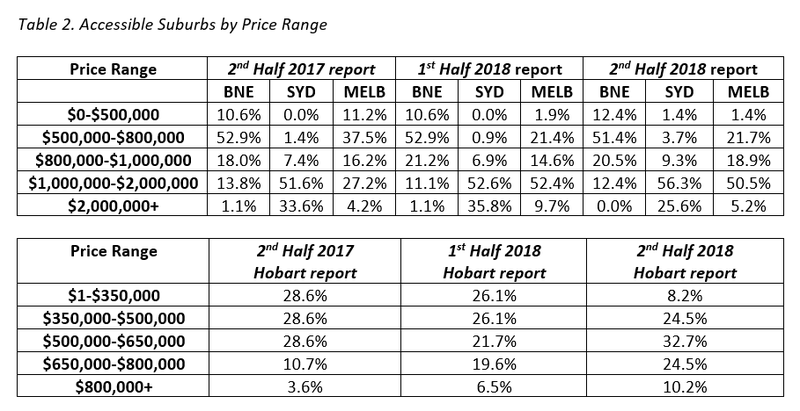 In the 1st half of 2018 Hobart provided the lowest entry price with the highest rental yield; however, this is no longer the case. Whilst it might be true for houses, both Brisbane and Hobart compete for the title of most affordable, with the highest rental yield for units. This is due to the softening in the Brisbane unit market, as well as the upswing in the Hobart unit market. Property trends – all suburbs considered will have a minimum of 20 transactions for statistical reliability purposes, with positive price growth from 2017 to 2018. Investment – as of June 2018 the suburb will have an on-par or higher rental yield than Melbourne Metro, and an on-par or lower vacancy rate. Affordability – suburbs with a median price below the maximum sale price of state average home loan plus allocated premium percentage. The premium percentage added for a hotspot suburb must be below the premium percentage added to purchase the relevant capital city median price. Project development – the suburb has a high total estimated value of project development for the 2nd half of 2018. This ensures sustainable economic growth, having a positive effect on the property market. Liveability factors – this includes ensuring low crime rate, availability of amenities within a 5km radius (i.e. schools, green space, public transport, shopping centres, and health care facilities), and an unemployment rate on par or lower in comparison to the state average (as determined by the Department of Jobs and Small Business, June Quarter 2018 release).